The F-22 Raptor, the US Air Force’s advanced stealth fighter, is primarily used to scout and identify targets in the battle against Islamic State, and a captivating new video shows it participating in an air-to-air refueling. 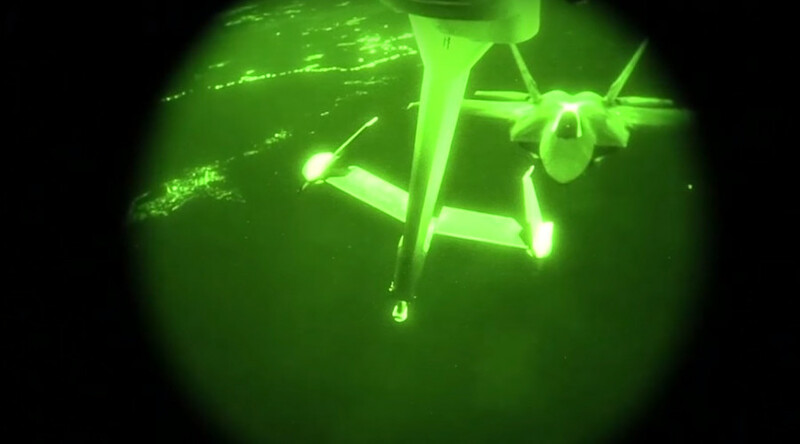 Released by The Aviationist on Monday, the video captures the fighter, built by Lockheed Martin, being refueled by the 908th Expeditionary Air Refueling Squadron during a night mission against Islamic State (IS, formerly ISIS/ISIL) targets in July, in support of Operation Inherent Resolve. The craft is shown being receiving the nozzle in its dorsal fuel receptacle, and viewers can even see a jet of vapors coming out of the back of the craft before the port shuts itself. The F-22 seen in the video is the most modernized version of the craft currently in service, The Aviationist reports. The up-to-date Raptors have been assisting in the fight against IS since the US intervention began, but have mostly taken the role of intelligence, surveillance and reconnaissance gathering. They are equipped with an active electronically scanned array (AESA) radar and infrared/ultraviolet missile launch detector to electronically map out targets for other crafts to strike and detect any incoming threats. However, the F-22 has sometimes taken a direct combat role in air strikes, dropping 270 bombs at some 60 locations between September 2014 and July 2015. The most advanced Raptors, like the one shown in the video, can carry eight 250 lb (110 kg) precision-guided small diameter bombs. On July 13, the same date that the air-to-air refueling video was filmed, coalition forces destroyed an IS fighting position near Manbij, in northern Syria.